Haviland Lake, April 31, 2008. Abies concolor occurs in all the Four Corners states but is not common in the range of this web site. Within its western range, Abies concolor does often occur in mixed and pure stands in great numbers. Perhaps its scarcity in the Four Corners region is due to its heavy use by the Anasazi and later by white settlers and logging operations. Abies concolor is a handsome tree, which does, however, as this photo indicates, tend to become distorted with age. Philip Miller named this genus in the 18th century; "Abies" is the classical Latin name. "Concolor" is Latin for, "with color", describing the rather even coloration of this species. 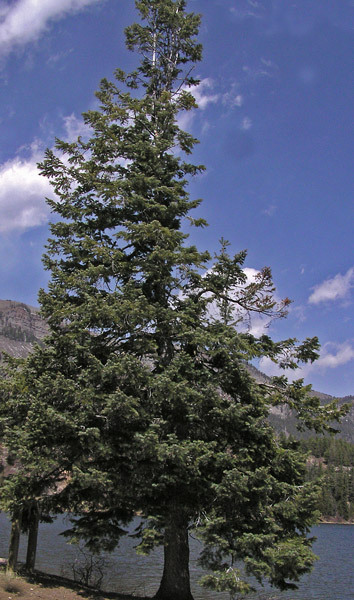 The species was first collected for science by Augustus Fendler in his mid-1840s botanizing in New Mexico and the plant was first named Picea concolor by George Gordon and Robert Glendinning in 1858. It was renamed Abies concolor by Lindley in 1861, and, interestingly, it was given a third genus name in 1868 when the eminent botanist George Engelmann named it Pinus concolor. 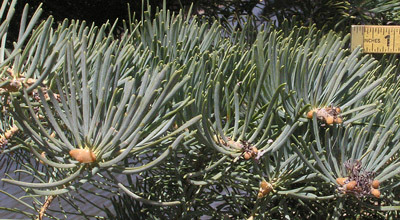 Leaves are sharply upward curved, pale blue-green, and blunt-tipped. Click to compare the leaves, bark, and other characteristics of Abies concolor with those of Abies bifolia. 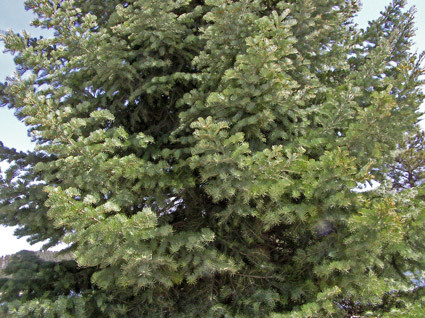 Click for more information about Abies concolor. 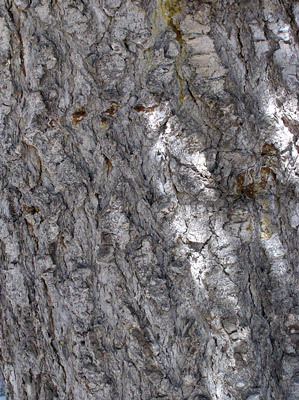 Bark on young and mature trees is light gray but ages from smooth to furrowed and scaled.